"This shortbread cookie is a traditional Scottish recipe. 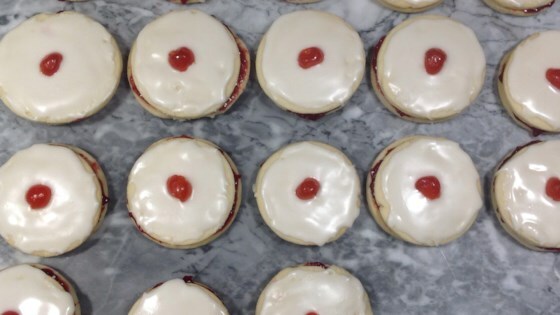 These are round cookies sandwiched with jam and topped off with a delicious icing and a cherry." In a large bowl, cream together the butter and sugar until smooth. Gradually stir in the flour until well blended. On a lightly floured surface, roll the dough out to 1/4 inch thickness. Cut into rounds using a cookie cutter. Bake for 8 to 10 minutes in the preheated oven. Allow cookies to cool on baking sheet for 5 minutes before removing to a wire rack to cool completely. Sandwich one teaspoon of jam between two cookies. Repeat with remaining cookies. In a medium bowl, gradually stir the milk into the confectioners' sugar until the icing is of a spreadable consistency. Spread on top of the sandwiched cookies. Top each cookie with half of a cherry while the icing is still wet. Marcie, thanks for this recipe! I will be using this recipe for Christmas and any occassion. My grandmother is from Scotland and use to make these all the time. These came out just like her old recipe. It's a tough batter to work with (gets really sticky) but worth it in the end.